Having Cluster Headache (especially in a bad-cycle) can beat anyone down. It can leave you exhausted and weak. 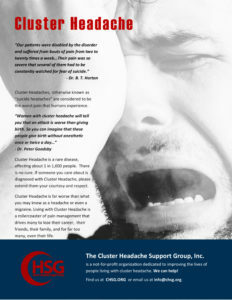 Over a period of time, a bad cluster headache cycle can leave you weakened and exhausted. Having had pneumonia twice, the experience is very similar. 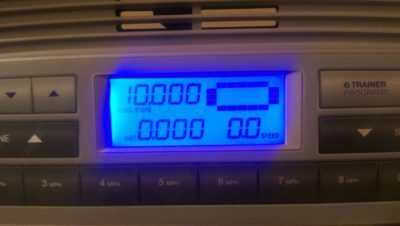 Loss of strength and endurance (wind) is common. To combat this, you need a change in your life. The topic of exercise comes with many things you should know. Good things such as benefits like increased endurance, and strength. But don’t think that after a couple of months you will have the endurance of Lance Armstrong or the strength of Arnold Scwarzeneger. These gentlemen saw their amazing athletic feats come from years of cutting-edge exercise. We are looking for just a small bump in our strength and endurance. We want enough of a bump to live life before, during, and after a cluster headache cycle, plus have time for the loved ones in our life. NOTE: Please get a doctor’s okay before exercising. Don’t think this is the sample legalize of every other website. Your doctor knows you! Explain that you want to start a gradual exercise program that includes strength training and some cardio, and maybe some Tai-Chi (more on that later). Keep your doctor in the loop. To exercise you need to be aware of your needs. We all have needs. For me, reading comic books, listening to music, playing guitar, and Tai-Chi are daily needs. For exercise, you need rest, a small program to fit your busy life style, and to avoid feeling like you were run over by a truck the next day. Not only do you need to be aware of your needs but before you start this journey, you need to visualize it. See yourself as you are now. Look at all things you can do, the people you know and love. Can you see them? Now look at all of things you want to do. They are there, but may seem just out of focus. Now imagine the journey. Look at all of the people on that journey — the faces, the smiles. Now visualize the destination. Is it a place or a time? It can be both. To arrive, you have want it. It must have a priority in your life. Nothing meaningful, ever happens in life on accident. Now open your eyes. If you are ready, let’s begin.